My blog is 12 years old this month! And to celebrate I’m giving away Gypsy for the last five days of September on Amazon. Here’s a very old picture with a shot of an earlier incarnation of the blog back in the day when I learned a little html so I could link and post photos. My son did the vast majority of coding, and it was only this year that I took over as “admin” as well as “owner” of http://www.cynthiaharrison.com. So for wallpaper, I wanted blue with darker blue stars and he wrote a program for that. I wanted “A Writer’s Diary” to be spelled out in script and he wrote the code to do that, too. 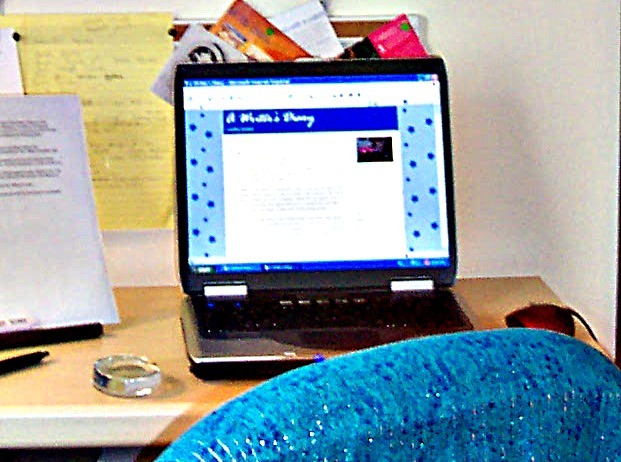 Many changes through the years, in wallpaper, in blogging tools, and “rules” of blogging. This year, I finally stopped calling my blog “A Writer’s Diary” because I was ready to write about more than writing. But sometimes I still do. Now I’m just using my name. Those are two “rules” I thought made sense for my blog this year. (1. Don’t write about writing if you are a writer. Hahaha. I did that for a really long time, but at a time when hardly anybody else was doing it. 2. If you’re published, call your blog by your author name). Also pictures. I use them with every post now. This one took forever to find, but woth it. Also, I’m blogging less. For at least five years, I blogged every single day. It’s been a great adventure. I started out with zero books published in 2002 and wrote all about my efforts to make writing a daily habit and become a published author. By 2007, I had my first book out. Coincidence I started blogging less? Nope! I began publishing novels soon after that first book. My first published novel, Sister Issues, an indie e-pub, came out the same time I landed a publisher for my contemporary novels. They’re mostly about relationships, and not just boy/girl, although there is that. I also like to tackle offbeat cultural and social issues. This year I indie published two paranormals on a whim. (Gypsy and its sequel Sweet Melissa) and revised that first book to reflect the changes social media and “The Kindle” has brought to publishing. Biggest change since 2002? Way more wrinkles. Also “blogger” is a legit term. Wow, it really wasn’t in 2002. Readers, thank you. And don’t forget your free copy of Gypsy. I admit that I just grabbed my copy of ‘Gypsy’. Thanks Karen, hope you enjoy! I am wondering if “free” is losing some of its cache now that people can subscribe and get so many free books. Maybe next year I’ll offer an online course! Great to read a fantastic success story from someone who really knows what the last 12 years have been about…wonderfully inspiring and long may it continue! Sue, it is! But I never run out of things to say, lol. Wow. That’s quite an accomplishment! A big congrats from California! Thanks Jan! Does not seem so long. It’s fun to look back, remember where I’ve been. I just looked up my wedding anniversary post (that’s tomorrow) from 2002 and boy I was NOT happy with the Mr. Here I am married now for 29 years. It was only 17 years then. I was so shy about being unhappy and I remember typing that post out into the void thinking I couldn’t say how I really felt, but just hint at it. Then I thought nobody’s gonna see it anyway. Except I just saw it again all these years later and it made me laugh. Now I just buy my own flowers and chocolates. Happy Birthday my blogging friend! I’m so glad you continue to share your journey. That is a long time to blog.